Here’s the News Channel 10’s Video of it. 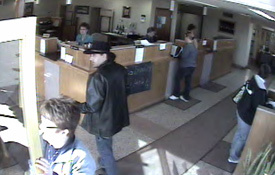 It was about 10:45 a.m. on Friday morning when as yet unidentified man, estimated to be in his early 30s handed a teller at The First State Bank of Boise City a note demanding money. The note, as of yet unreleased, purportedly threatened to set off bombs in the bank and the Boise City Elementary and High Schools if the teller didn’t empty her money drawer. 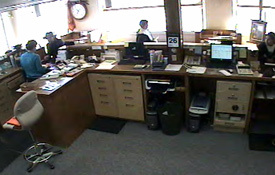 The teller complied and the man, visible on security cameras exited the bank. He is then thought to have climbed into either a cream or off-white mini-van or small SUV, perhaps with Louisiana tags. The vehicle was driven away by a woman in her 30s reportedly wearing a pink blouse. The direction of travel was thought to be east on Highway 412/3 toward Guymon. However, if the duo drove east they could have turned toward Stratford or angled toward Elkhart as well as traveled to Guymon. As of Saturday morning the area of search had been widened to a 500 mile radius. Before leaving the bank he left what could have been an explosive device. The bank was evacuated.In reaction to the multiple threats the Boise City schools were also quickly evacuated, and the students taken to two safe locations; school was later dismissed. The schools in Felt were also reportedly evacuated and the Keyes school went into a lockdown mode. Police Chief Dale Harper, Under Sheriff Derek Kincannon, and Patrolman Tonya Hicks quickly threw up crime scene tape around the building. 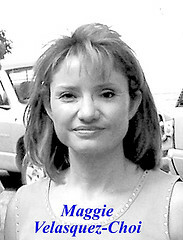 Harper then contacted OSBI Agent Morgan Wilkinson and calls also went out to the FBI in Woodward and Oklahoma City. An Oklahoma Highway Patrol Bomb Squad flew from Oklahoma City, and one trooper suited up and made multiple entries into the bank before making the decision that the device was not an explosive. The two Boise City Schools were also cleared of explosives using bomb-sniffing dogs. The robbery is similar to one executed in Noble, just south of Norman earlier this month. That robbery is also under investigation by the FBI and the couple is suspected of committing both robberies. Posted by Blake Wells on March 3, 2010 in 103 and tagged Bank Heist, Bank Robbery, Bomb, Bomb Threat. 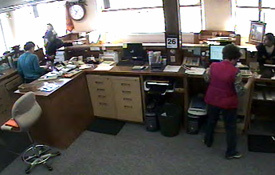 Below are several photographs taken from today’s robbery of First State Bank, 20 Southwest Square, Boise City, Oklahoma. At approximately 10:36 a.m. this morning, a white male entered the bank and provided a demand note to a teller. 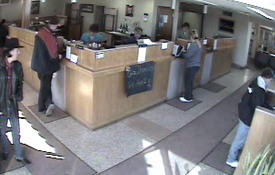 The robber said there was a bomb at a local school, and he set a device he described as a bomb on the teller counter. It was later proven to be a hoax device. There was nothing found at the school. The robber gathered the money and fled with a white female in a white minivan or SUV. They were believed to have traveled east on Highway 412 from Boise City. No one was injured and no explosive devices were located. 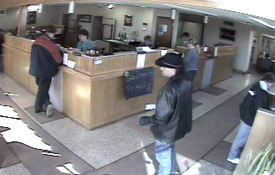 The same individual is believed responsible for the February 12, 2010, robbery of First Fidelity Bank, 900 N. Main Street, Noble, Oklahoma. In the February 12 robbery, the suspect was seen driving a maroon four-door car. 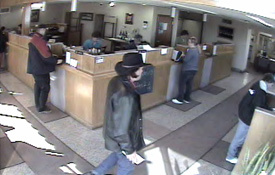 The individual who entered the bank was described as a white male, shoulder length brown hair, 5’9″, 170 lbs., in his mid 30’s, wearing a Aussie style hat with a leather band, a hip length black leather coat, a purplish-colored collared shirt, blue jeans, and black cowboy boots. The female who remained in the car was described as a white female, heavy set, in her early 30’s, shoulder length light brown hair, who was wearing a pink shirt. The investigation is being conducted by the FBI, Boise City Police Department, Cimmaron County Sheriff’s Office, the District 1 District Attorney’s Task Force, the Oklahoma Highway Patrol, and the Oklahoma State Bureau of Investigation. The FBI’s bomb technician was also on the scene to examine the device left at the bank. If anyone has any information, please contact the FBI at (405) 290-7770 (24-hour number). A reward of up to $2000 is being offered by the Oklahoma Bankers Association. 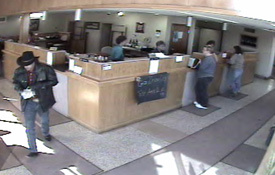 Posted by Blake Wells on March 3, 2010 in #1 News, 103 and tagged Bank Heist, Bank Robbery, Bomb, Bomb Threat. Apology about last week’s article: I said that Jeremy Wariner’s 400 meter race was August 23 but it turned out to be the wrong date. I usually try to check with two or three sources before I write such information but in this case, after a lengthy search, I only found one website and it stated that it would be on the 23rd. Later in the week I found the more trustworthy nbcolympics.com which gave all the schedules, plus videos and fun athletes’ information. No, I didn’t get to see Jeremy run his race. I wondered why my television showed archery, taekwondo and weightlifting most of the day. I kept waiting for the women’s (and toddlers) gymnastics but they never showed. It finally dawned on me that Korean TV only showed games in which there were Korean competitors. The only Phelps swim race that I saw was the one in which a Korean also swam (the Korean got the silver). I tried to watch the replays of Jeremy and Michael Phelps on nbcolympics.com but a caption popped up that said “sorry, viewing is prohibited outside of the United States”. Posted by Blake Wells on September 5, 2008 in #1 News, Area People, On Cultural Encounters and Tangents. As the saying goes, “There’s no place like the Oregon coast.” I will agree with that 100 percent. This past weekend I went on vacation with my family to Oregon. We spent two nights there. Our vacation started on Thursday as we headed to the coast. Our first stop was Astoria, Or. to check in to the Bed and Breakfast my mom got for us. After that we headed for the beach. But before we went to the beach, we all decided to go to a town called Cannon Beach and go to the Ecola State Park. In this state park you can get a view of Haystack rock and you can also see a light house in the distance. The view was beautiful because you could see on and on. 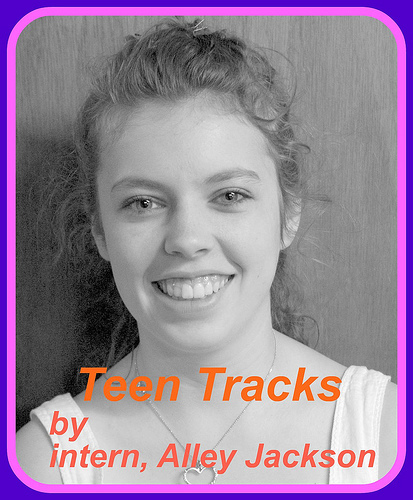 Posted by Blake Wells on September 5, 2008 in #1 News, Area People, Teen Tracks and tagged museums, Wax Works. Last week I received several phone calls from distraught landowners about a proposal from Oklahoma Department of Transportation (ODOT) to redo the curves on State Highway 136. The plan smoothed out the two curves right before the Texas state line. The problem was the plan put a highway between an existing house and its barn and riding arena. It also would destroy half of two irrigated quarters of farmland. Thank you to the 200 plus people who signed a petition at the Texas County Fair to ask ODOT to reconsider its current plan to change State Highway 136. I spoke to Division VI Director, Robert Ward on Monday and he agreed to look at other options on this road. On Thursday, I spoke with ODOT Director, Gary Ridley, and he also agreed to scrap the present plan and look at other options. Posted by Blake Wells on September 5, 2008 in #1 News, Area People, Capitol Corner. The pre-K through 12th years of school are about a lot of things, and down the road we all hold memories of our school days. The Felt students got a special dose of memories to be made right along with some studies in geology, history, and geography. On Monday, August 15, 2008, we were able to build some special memories with a school bus heading to see the river run! Word has it that the Beaver River last ran twelve years ago, but that it was a trickle rather than a gusher. Some have said the last time it ran bank-to-bank as it did on Monday, August 15, was twenty some years ago. Whether those dates are accurate or not, only the oldest of Felt’s students have any memories of a reason for the bridge between Felt and Boise City. Now there is definitely reason and lots of people are back to working on water gap fencing. Posted by Blake Wells on September 5, 2008 in #1 News, Area People, School Stuff. WE NEED YOU TO BE THERE!!! Thursday evening at 5:30, there will be an organizational meeting of the Boise City Parent/Teacher Organization. I am challenging you to attend this meeting-this organization is the “link” that we need for a successful school year. Officers will be elected and several projects will be discussed. This one hour will be the best investment of time that you can make and this organization certainly reiterates the focus of the 2008-2009 school year which is to “Push the bar above the line will be the goal in 2009”. I have enlisted the help of individuals in the community to assist with a telephone campaign to encourage the parents of high school students to attend this meeting. I am going to offer the following rewards for membership: if a class achieves 90 to 100% membership-pizza party, 75%-DQ ice cream cone, 50%-10 minute early-out to lunch. This organization is open not only to parents but anyone in the community who is interested in the education of students at Boise City Schools. PLEASE bring your $5.00 and be a part of this important organization. This Saturday, from 1 to 4 p.m., the Cimarron Heritage Center will host a reception in honor of the showing of photographs shot by Dusty Reins, of Amarillo, and Cimarron County’s Shelley Fowler. The exhibit is titled “Chasing the Light in Cimarron County” and features photos taken all over the county by Reins and Fowler. 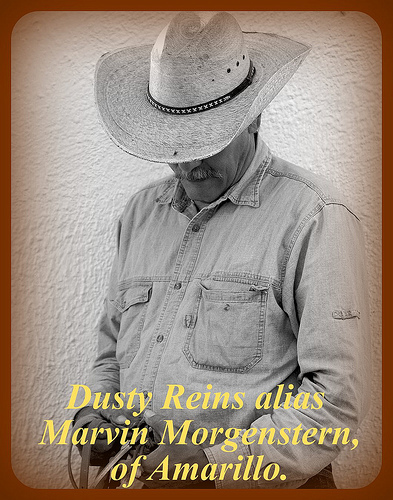 Reins is the nom de plume, of Marvin Morgenstern, of Amarillo. By phone to the Boise City News, Morgenstern/Reins explained that he was a Mass Communications major at Texas Tech in the 1970s when he came up with the name. 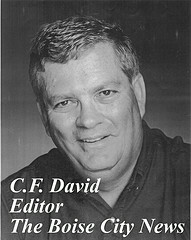 Reins is a 1971 graduate of Amarillo’s Caprock High School. Posted by Blake Wells on September 5, 2008 in Area People, Off The Cuff. I have been trying to think of an apt analogy that would convey with clarity how I’m feeling about the photo exhibit Dusty and I are preparing to share with all of you. The only image that keeps popping up in my brain is that of Lady Godiva riding a white steed down cobblestoned streets! After pondering the “why” of such an odd comparison I realize that it is indeed quite fitting! For I am preparing to be (figuratively, of course) naked before the world, allowing whosoever chooses to view, examine, critique and hopefully appreciate parts of my body. Or rather, parts of my body of work that express and expose pieces of my soul as seen through the lens of a camera. Posted by Blake Wells on September 5, 2008 in #1 News, Area People, Off The Cuff. Posted by Blake Wells on August 25, 2008 in #1 News, Area People, Farm & Ranch News and tagged beaver, Cimarron, River. This tower went up seven miles west of Boise City on property owned by the Dwayne Hegwoods. Another is northeast on Jere and Verlene Hughes’ place. At Right: Instrumentation to measure wind direction and speed is used at various heights; the tower is 199 and one-half feet. Posted by Blake Wells on August 25, 2008 in #1 News and tagged Towers, Wind Generators & Wind Energy, wind testing. Oklahoma City-Grant and loan application deadline for the next Oklahoma Agricultural Enhancement and Diversification program is October 1. State agriculture officials are urging all producers with innovative ideas to apply. Agricultural diversification grants of up to $5,000 are available as well as interest-free loans in three categories: Cooperative Marketing Loans, Marketing and Utilization Loans, and Basic and Applied Research Loans. Posted by Blake Wells on August 25, 2008 in #1 News, Farm & Ranch, Farm & Ranch News and tagged ag loans, Loans. Last weekend we got some new visitors in our church The younger of the two blond California men, who were fresh off the plane, had been newly hired to teach English at a local university while he works on his Ph.D. He came early to get settled in and then he’ll call for his wife and two younguns to come on over after a few days. His father tagged along to help him get settled in and to look around for a week. On Sunday Tom, Andy and I took them out to try to get them as “settled in” as you can do on a Sunday, which isn’t much. After having lunch in a Korean restaurant we hit the road (they are vegetarian so they will be limited in their Korean food offerings since most foods contain fish). We found out that they can’t get a cell phone without an alien registration card and a Korean credit card or a Korean citizen’s co-signature and their account. They can’t get a prepaid cell phone without a Korean alien registration card (which the university will later help him get). Thus, there was not much we could do without that dern alien registration card. Posted by Blake Wells on August 25, 2008 in #1 News, Area People, On Cultural Encounters and Tangents. Born Aug. 3, 2008. He weighed seven pounds and four ounces, and was 19 and one-quarter inches long. Proud parents are Mick and Leona Cryer of Felt. Other excited family members include: Grandpa Melvin Cryer of Felt; Grandma Anita Smith, of Whitehouse, Texas, and a slew of aunts, uncles and cousins. Posted by Blake Wells on August 25, 2008 in #1 News. Dennis and Sheryl Brittain of Medford, proudly announce the engagement of their daughter, Leisa Brittain to Jeremy MacDougall of Enid. The couple will be married at 6:30 p.m. on Aug. 30, 2008 at the First Baptist church, of Medford. Leisa is a graduate of Medford High School, and is a Website Partnership Developer for natural Enviornmental Systems in Enid. Jeremy is the son of John and Angelina Harper, of Las Vegas, N.M. He is a graduate of Enid High School and is a machine operator for Advance Food company in Enid. Grandparents of the bride are Frances and the late Jiggs Mark, of Medford; Mildred Kesler, of Pond Creek; Ben Gibson, of Enid; and the late Doris Ross, of Humphrys, Mo. Grandparents of the groom are Lupe and the late Pedro Alba, of Boise City, and Mr. and Mrs. Charles Harper, of Moorland. Posted by Blake Wells on August 25, 2008 in #1 News, Area People. Living in Washington State helps me with my adventures of the world. One of the world’s most famous structures is right here in Seattle. The Space Needle is one of the sights I have wanted to see and my wish has been fulfilled. A little information about the Space is that it is a major landmark for the Pacific Northwest and a symbol of Seattle. The Space Needle was created and built for the 1962 World’s Fair. During this time of the Fair, the Space Needle had 2.3 million visitors. The Space Needle is 605 feet high and 138 feet wide and it weights 9,550 tons. In my opinion, the view is amazing. One of the most breathtaking I have ever seen. But, it can be a little overwhelming ,with the magnitude of all the things you can see from the top. Posted by Blake Wells on August 25, 2008 in #1 News, Area People, Teen Tracks. This week, I met with representatives from OG&E to get an update on the wind energy situation. They also met with Guymon officials to answer questions that they may have on the developing scenario. It was a great meeting that answered many questions. OG&E has made a commitment to build the needed transmissions lines from Oklahoma City to Texas County. They are building a 345 Kilo Volt line from Oklahoma City to Woodward, which is a type of structure that is fairly common in their power grid. However, they have little experience with the 765 KV line from Woodward to Guymon. Posted by Blake Wells on August 25, 2008 in #1 News, Capitol Corner. Kaley was next to a 211.4 pound, 56 day old Dill’s Atlantic Giant pumpkin. This variety was specially bred by Howard Dill of Windsor, Nova Scotia, who spent many years developing a large strain of pumpkin. Other growers have further refined the variety, breeding selected plants to get bigger and bigger pumpkins. This plant is of unknown crosses; and this pumpkin was grown as a bet. It was estimated at 235# before cutting, and the back was curved in, making it lighter. It was harvested Tuesday August 12th. Posted by Blake Wells on August 25, 2008 in #1 News, Area People, Farm & Ranch and tagged Giant, Pumpkins.